In a series "Placebos in Medicine", published recently by The Lancet, this topic was discussed by several authors (1-5). The article "Is there a logic in the placebo?" reveals the main concern of modern medicine, how to define it scientifically, and the author concludes: ". . .the fact that placebo effect is better than no treatment does not make placebo an active treatment." (2). In "The placebo in general practice", the author concludes that: "Doctors can interpret illness in whatever way they wish, and the placebo, by making the patient feel better, will support their view (2). Even surgery can act as placebo (3): "Many operations for cancer have not been properly evaluated by randomized control trials, and there are situations where the placebo effect is likely to be strong but the specific effect may even be harmful." In psychiatry, palcebo effects are outstanding (4). A classification of placebos is given in: "Harnessing placebo effects in health care" (5). The authors also conclude that :" The direction of the placebo effect cannot always be anticipated. Inert treatments resembling anticholinergic drugs cause salivation, and insulin-like placebos cause hyperglycemia rather than hypoglycemia. This could be regarded as anticipatory homeostasis." The placebo effect is "any dummy medical treatment; originally, a medicinal preparation having no specific pharmacological activity against the patient's illness. . ." (6). This definition summarizes the attitude of modern medicine to placebo: a useless and undesired side effect of treatment. This is unfortunate since a placebo mobilizes the healing force of nature (7). Imagine, a simple starch pill is capable of relieving your headache. Or, 60% of gastric ulcer patients can be cured by placebo tablets. Could you still ignore this important factor in therapy? Since healing force of nature controls all processes of our body, the placebo effect is the main concern of normative medicine (8-11). 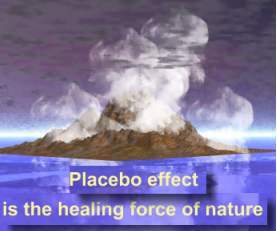 Placebo effect is the healing force of nature. Firstly, we ought to note that the placebo does not cause anything in the body, it triggers its natural response, which is defined here as the healing force of nature. Like any other response in the organism, the placebo effect was selected in a Darwinian fashion, and today's organisms are equipped with the best placebo effects. Not only humans, any organism in the world is equipped with valuable placebo effects. The placebo effect is the manifestation of the Wisdom of the Body, and since "the direction of the placebo effect cannot always be anticipated" (5) the physician ought to interrogate the Wisdom of the Body in order to find out. In any case, the placebo effect is always beneficial since it improves tolerance. Treatment should first exploit the placebo effect and only if necessary supplement it with specific therapy. Placebo pharmacology should search for new placebos with higher tolerance value, and investigate how they should be administered. This important concept was abandoned by modern medicine as irrational and non-scientific, particularly since modern medicine attempts to adopt the reductionistic approach of the exact sciences. Aspirin, for instance, is a molecule which obeys chemical laws. Its transport across membranes and through compartments is governed by rigorous pharmacokinetic equations which should be considered during treatment. This conceptual framework ignores the placebo effect since being without any "specific pharmacological activity against the patient's illness." (6). However, aspirin has two undesired (conceptual) properties that undermine the pharmacokinetic dogma. The equations do not explain why aspirin is effective, and more, in many instances the same effect can be achieved with a placebo. There is nothing in the pharmacokinetic theory which accounts for the placebo effect. In order to keep the theory consistent, the placebo effect is regarded as random error or noise which can be ignored. A pharmacokinetic process can be represented by the following equation: Effect = Model + Error. The model is a set of differential equations which describe the behavior of aspirin in the body and predicts its effect. The error term accounts for biological variation and the placebo effect. It has two properties: 1, it is randomly distributed, and 2, it can be reduced by increasing the number of observations. Yet the placebo effect does not share the same properties and therefore differs from random error. It is neither randomly distributed, nor can its effect be diminished by increasing the number of observations. Firstly, a placebo effect is always positive. The starch pill does not cause a negative effect, e.g., headache, and if effective will relieve headache (which is a positive effect). The frequency distribution of placebo effects is always positive and cannot be considered as random error. Unlike random error, increasing observations will never decrease the placebo effect. For instance, about 60% of patients with a gastric ulcer can be cured with a starch pill. No matter how many patients are examined the outcome will always be the same. Obviously the error term in the above model does not account for the placebo effect and the model is wrong. In order to make the model consistent with clinical observations, the placebo effect ought to be represented by a separate term: Effect = Model + Error + Placebo Effect, which is generally not done. The model is still applicable when the placebo effect is negligible. Generally however, the placebo effect cannot be ignored and the models are wrong. Since modern therapy is designed with the aid of such models, they are obviously iatrogenic! The placebo effect cannot be explained by reductionistic arguments, in terms of molecules, or physical forces. It can be understood only in the context of the organism, and since pharmacokinetics lacks concepts for dealing with holistic phenomena, they are generally ignored as noise. The second definition of placebo given in Dorland's dictionary is: "a dummy treatment administered to the control group in a controlled clinical trial in order that the specific and non specific effect of the experimental treatment can be distinguished" (6). This definition unveils another conceptual flaw of medicine. When testing a drug in non cancerous diseases, its effect is always compared with a placebo, "since in order to be considered effective, the experimental treatment must produce better results than the placebo" (6). In cancer, on the other hand, experimental drugs are always compared among themselves, and never with a placebo. Oncology presumes that in cancer the placebo effect is ineffective and need not be considered in clinical trials. This conclusion is based on the false premise that the cancer patient is defenseless. Which is unique to cancer, since in all other diseases the organism continually attempts to improve its condition (10). Placebo treatment of cancer is regarded as unethical, however in advanced cancer it may be effective particularly if alleviating suffering. A Stanford psychiatrist reported "that psychotherapy lengthened by a year and a half the lives of women with metastatic breast cancer, while reducing their anxiety and pain as well" (12). Psychotherapy is obviously a placebo, since lacking a "specific pharmacological activity" (6). It illustrates the importance of placebo treatment in advanced disease. Normative medicine postulates that even in cancer the organism continually attempts to improve its condition, exhibiting a placebo effect, while the false notion of an indolent organism precludes oncology from studying the role of the healing force in cancer. 1. Gotzsche PC. Is there logic in the placebo. The Lancet 344:925-926, 1994. 2. Thomas KB. The placebo in general practice. The Lancet 344:1066-1067, 1994. 3. Johnson AG. Surgery as a placebo. The Lancet 344:1140-1142, 1994. 4. Laporte JR, Figueras A. Placebo effects in psychiatry. The Lancet 344:1206-1209, 1994. 5. Mark D, Saintonge Ch de, Herxheimer A. Harnessing placebo effects in health care. The Lancet 344: 995-998, 1994. 6. Dorland's Medical Dictionary. 27th Edition. WB Saunders Co Philadelphia, 1988. 7. Zajicek G. Healing force of nature. Cancer J. 8:4-5, 1994. 8. Zajicek G. Wisdom of the Body. Cancer J. 7:212-213, 1994. 9. Zajicek, G. The Normal and the Pathological. Cancer J. 7: 48-49, 1994. 10. Zajicek G. How to treat cancer? Cancer J. 7:132-133,1994. 11. Canguilhem G. Le Normal et le Pathologique. Translated into English by Fawcett CR, Cohen RS. Zone Books New York 1991. 12. Barinaga M. Can psychotherapy delay cancer deaths? Science 246:448-449, 1989.